Happy New Year! Wow, it's been quite some time since my last entry. So, I thought the ladies that are interested in the history of riding aside might find this gem from 1838 an interesting find. It has some very interesting "attitudes" from the day. One of the things I found of particular interest was the idea of having a horse of the "proper" color. This is a very medieval concept, in fact it might possibly be much earlier. "Of all colours presented by the horse, none is so rich, and, at the same time, so elegant and chaste, as a bright bay; provided the mane, tail, and lower parts of the legs, be black. A small white star on the forehead, and a white speck on one of the heels, are to be considered, rather, as beauties, than defects: but much white, either on the face or legs, whatever be the general hue, is quite the reverse of desirable. After bright bay, chestnut, perhaps, deserves to rank next in the scale of taste; provided it be not, as is very frequently the case, accompanied with white legs. Some of the various shades of grey, however, are, in the opinion of many, entitled to be placed above it: of these, the silver grey, with black mane and tail, claims the highest place. Brown is rather exceptionable, on account of its dulness. Black is not much admired; though, as we think, when of a deep jet, remarkably elegant. Roan, sorrel, dun, piebald, mouse, and even cream colour (however appropriate the latter may be for a state-carriage-horse) are all to be eschewed." To Choose every horse by his color (Section III). The best color of any horse is a black bay with a gilt mouth and under the flanks the same color up to the navel. And that his lips be full of rivuls (wrinkles). For this is a sign that he will be a fierce horse. For to know the beauty of this horse: look that he has a white star on the forehead or a white feather (snip) on the nose. A white foot (sock) behind, and a little, lean head, short ears, open nostrils, and a large eyes, and a broad forehead, long at the rein, a thin mane. Broad breasted, and side branded, lean knees, and a brode, thin leg, great sinews (tendons), short pasterns, side ribbed, and a broad, hollow. dove foot. Short loined, and a long skete, and small stones (testicles) in his cod. And that he stand upright on all four feet, one against the other, and these are the best properties that any horse may have. One will note that the author states that a dark bay with a gold mouth with minimal white markings is nearly identical to the desire for a "bright bay" for a lady's mount. The 15th century treatise goes on to list the rest of the horses by color. a sorrell with white mane and tail with a walle eye on the "off side", a dapple gray with black dapples on his legs and swirls on both sides of his neck, a dun horse with a black stripe, a white horse, a mouse dun, a black horse with a white snip and a white fore leg and a white leg on the off side, a coal black horse, iron grey horse. I would prefer to write of more side saddle experiences, but for the moment, I have to accept the fact that my horse is not suited for it, not because she isn't game, but rather because of her incredibly steep hip tilt. So, what's a medieval chic to do? I must turn my attentions to more "classical" equestrian pursuits by which I mean hunting and martial skills. These are not modern dressage feats or modern hunting pursuits, this is using a sword or spear from horseback. 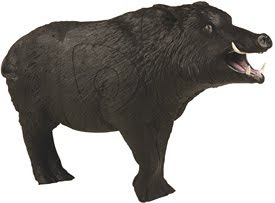 First things first, Phase I of the plan is to simulate the art of hunting boar, I have acquired a lovely 3D archery target of a most impressive beast. Naturally it is stationary to get the horses acclimated to monstrous beasties. Phase II, and if I see another one of these things with a boar's head, you better cite me. A Tourinha with a boar's head instead of a bull's horns, I call it a Boarinha. (I'll give it a more linguistically correct name when I have the time.) These items are used to teach bullfighting horses -- now before you spread the hate -- this is not about teaching my horse to fight bulls, it's about demonstrating historical technique. So, I will begin posting project pictures shortly. Part of the ensemble of a well dressed lady is her "hat". Our latest hennin is of the truncated style with a "butterfly veil" of creamy silk; crossed with blue silk, and studded with glass beads and golden pearls. Once again Kat of Kat's Hats in the UK has pulled off a stunning vision of handcrafted, red silk, medieval goodness. Our hennin is based on Giovanni Boccaccio's Le Livre des clèves et noble femmes MS. Fr.599, f.40 French. fifteenth century. Bibliothèque Nationale, Paris. We can say that we are pleased with the appearance and should have images up in our attire soon. I'm pretty excited. We're starting a new presentation at the local museum. As the title indicates, one on medieval hunting. It looks to be a promising one. 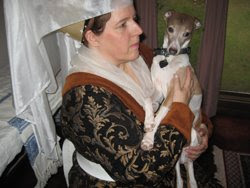 We will have ferrets, Italian Greyhounds, and Raptors. 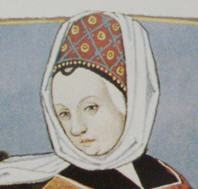 It is an opportunity to dress in the proper 15th Century Fashionista stylings of the Burgundian Court. I will finally get to wear my new hennin and show off my Iggies, Evie and Baby. Not all side saddles are equal. Recently, I was having Normandie fit for a side saddle and as my regular status indicated, we had some fit issues with the cantle area or lack of one. Basically it was packing down too much and would slide. Fitting takes time. In any case, I remember someone had mentioned a side saddle on consignment at a local saddle shop. So, Gail, Sue and I took a quick road trip to take a look at the saddle. This is the side saddle up for sale. If you do not know anything about side saddles or assume that they are fitted like other saddles, then you need to find an expert before riding or fitting one. 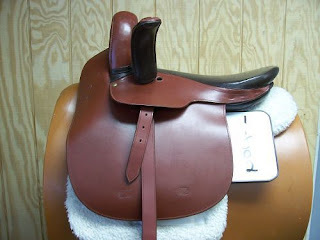 The pictured saddle is an example of a poorly crafted saddle. Things you can't see in the photo: The tree is twisted and slopes off to the off side, the center line is "off center". 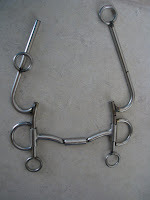 The finger billets on on the off side have a huge gap that would allow for the installation of an extra billet, the padding as typically found in most English saddles which makes up for the bars of a western, is practically non-existent and allows the saddle to dig into the horse's back. When a rider is sitting on the horse, their left seat bone is hanging off the side of the cantle. There is no saddle beneath them. This is a poorly made saddle by a maker that clearly doesn't know the first thing about side saddles. Ebayers beware. Oh, did I mention that the balance girth points in the WRONG direction? It angles toward the back of the horse rather than toward the front. If I can obtain the pictures from Sue that we took, you will see what we're talking about. A Swing and a Miss! Well this past Saturday, Gail and Sue made the trip north to try to help find a side saddle to fit one of my horses. After roughly 5 hours, we came close, but there were no carrots to be had. Sigh...these saddles are extremely hard to fit. We tried a Wayne Steele on Normandie. It was fitted and Gail mounted up for an inaugural ride. Normandie walked off alright, but then got half way down the side of the ring and did a little cow kick, almost like he was swatting a fly. It might have been, but then he did it again...this time in protest. Apparently the saddle rolled a little and it started digging his withers. Normandie is stoic when it comes to a lot of things; however, he is quite expressive when something isn’t right. Gail dismounted and we headed back for the aisle to try the second saddle, a nice Mayhew. Normandie was learning patience as he stood in the aisle and waited while the balance girth was set and then it was out to the ring for a second test. This one fit him a little better especially in the withers. Bob helped with a “pony” ride; Normandie followed him allowing Gail to concentrate on fit and feel instead of worrying about what Normandie was thinking. The saddle had new flocking and the packing down caused the cantle to dip low creating an uphill slope on the saddle; back to the aisle. We took the saddle off and bridle again and Norm stood on the cross ties while Sue, super saddler that she is, took the saddle to her car and opened up the padding and began adding more wool. She stitched it up, and we were off to the ring again for another test ride. Another swing and a miss; it rode better, but the saddle would still roll to the left as you rode. So, the consensus was to wait and try it out on other horses to see if it was a fundamental issue with saddle or something else. So, Jenn still has no saddle, but we’re still working on it. Sue is cogitating on the problem and we’ll see what happens. Since they were up my way and I had heard that there was a side saddle at a local saddle shop, we took a quick road trip and it was quite educational. The side saddle is an example of caveat emptor (buyer beware). I will address this in my next post. We've always wanted to have a medieval bit made for presentations and to further our understanding of the medieval riding experience, and to improve the overall impression in the field. After looking at several bits and some of the best renderings from artists of the time period, we settled on the drawings of Italian artist Antonio di Puccio Pisano (aka Pisanello d.1455). This first image is a sketch that detailing the action of the bit and the horse's mouth. You see faint indications of the shank shape. The mouthpiece appears to be a thick snaffle type. You can also see a very simple leather or fabric "curb" with a 'T' connection that goes through one of the bit rings. The next image gives a clearer view of the bit's shape, purchase, and connections. It also shows the almost ubiquitous bosses. You can also see another example of a curb "chain". In this case it looks like a leather/fabric type that has chain on the ends. 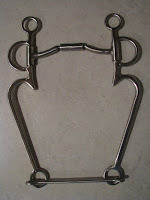 You can also see the two types of reins and where they are connected. When working with the professional bit maker here in the US, I submitted outlines and original images and after a brief exchange of functionality, a price was agreed upon (this is a custom bit). Within a day of the final drawings being submitted, the bit maker sent the next photo. It details the shank lengths and he was offering me a choice of which length I wanted to go with. The original bit was supposed to be 8" inches to fall more in line with Normandie's 7 shank Myler. However, the image that we provided suggested that the bit in the original art was a little longer. So, after a quick discussion, we decided to go with the longer shanks. This is the result, the complete bit. From the time that we designed, discussed, and had the bit in hand was 3 business days. One of those was the shipping.